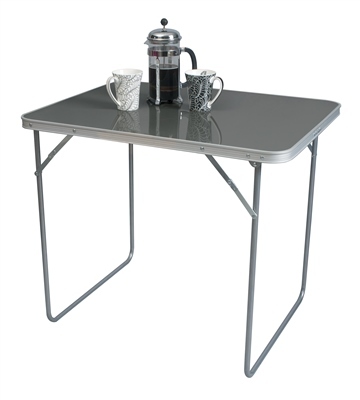 The Kampa Camping Table Medium features a fibreboard table top that has been laminated for easy cleaning and weather resistance. The table is 70cm in height and the strong steel legs fold neatly under the table for ease of transport and storage.The convenient carry handle attached to the table top also makes it easy to carry. Table bought mainly for my granddaughter to play on. For this purpose it is ideal as well as being an extra table for barbeques in the garden. Very solid and convenient as it is very easy to fold up. Good sturdy table. Well made. Light weight. Would recommend.